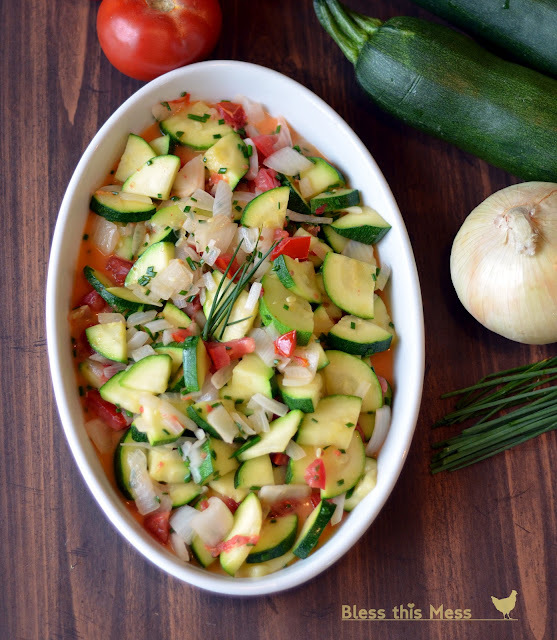 If you are like most of the country, zucchini season is here in full force. I love the stuff and of course my plant was devoured by insects long before it grew anything edible. I’m not too worried though; zucchini is one of those things that is easy to find because when they are on, they come in no small quantity. My mom’s garden in Indiana was also prolific with no shortage of squash. She was really good at using what her garden had to offer and we ate lots and lots of fresh vegetables all summer long. This is a recipe that she and I made up one day and loved it. It is about the only way we’ve cooked savory zucchini since; why mess with perfection? 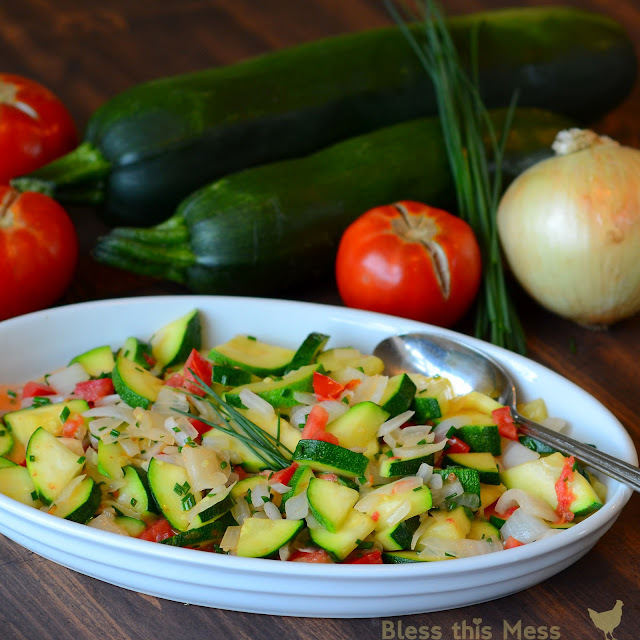 It is honestly my very favorite way to cook zucchini and I can eat most of the dish myself. Want to know what we did when the squash got away from her and she ended up with two-foot-long zucchini? She would let us carve them out into boats and decorated them. Then we would go to Anderson Falls in Indiana and set them sailing down the river. Our favorite part? When they went over the falls and crashed at the bottom. Pretty great mom, wasn’t she. In a large skillet heat the butter over medium to medium-high heat until melted. Add the onion and saute until the onion starts to get clear on the edges, about 5 minutes. While the onion is cooking cut the ends off of the zucchini and then cut it in to fourths long-ways. Slice each quarter into 1/4 to 1/2 inch slices. When the onion is starting to go clear on the edges add the garlic and chopped zucchini. 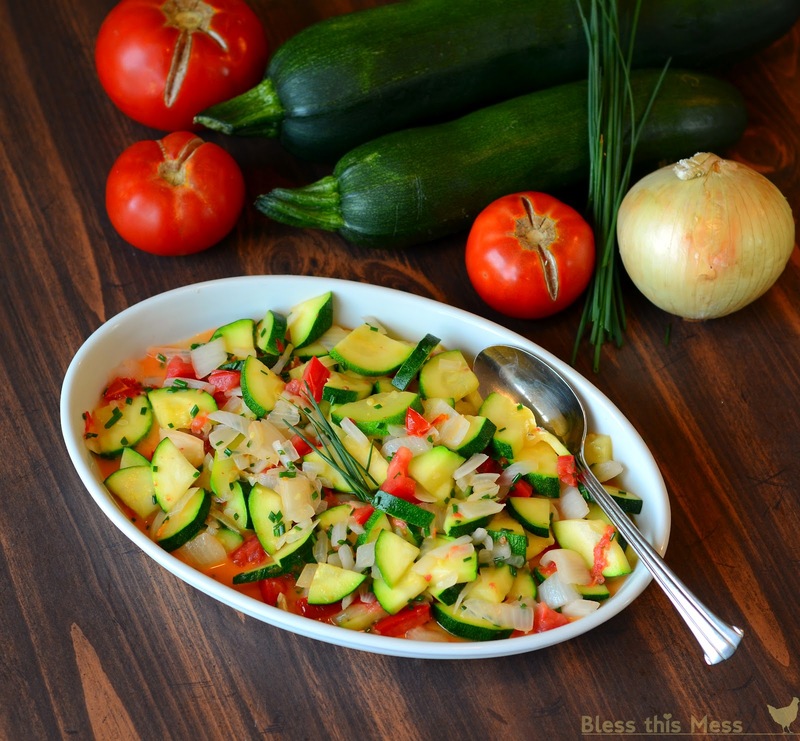 While the zucchini is cooking coarsely, dice your fresh tomatoes. When the zucchini is cooked to your liking (I like it al dente) add the tomatoes. Stir to combine and heat through without over-cooking the tomatoes. Remove from the heat and add your fresh herbs and plenty of salt and pepper to taste. Serve right away. I love to use cilantro, basil, chives, or parsley for this dish or a combo of herbs. If using an herb such as rosemary or thyme, only add about a tablespoon because they are a lot stronger than the ones first listed. Don’t overcook the zucchini unless you truly like it soft. Just a touch of crunch left in it is perfect. If using a medium or 2 small zucchinis then there is no need to peel or remove seeds. If you are trying to use up a large zucchini I would peel off the outside and remove the big seed after quartering it. Feel free to use a good quality olive oil in place of some or all of the butter. There is a whole lot of onion in this dish. If you aren’t an onion lover, then feel free to reduce the amount. I wouldn’t go less than a 1/3 cup of chopped onion though for flavor reasons. Can I just say that your blog is UH-Flipping-MAZING? Seriously! Your pictures are beautiful, your posts are written perfectly, and you have so much style! I swear, if you keep it up, your blog is going to explode with followers. You remind me of Pioneer Woman 🙂 I keep referencing back to your post on painting your hutch, because I want to paint some dressers for my daughter 🙂 Thanks for working so hard on your awesome blog. Too nice! I just need something to go viral. I just happened on some chicks blog who got her start because she posted about homemade pet odor remover and it went nuts – I know right… LOL. I’ll get there one day! Thanks for the encouragement. Just finished eating this for dinner. YUMMY. Used my veggies from the farmers market and added mushrooms and shrimp to bulk it up for an entree and served it over couscous. Healthy and delish. Thanks for sharing!